All eyes this week will be on the FOMC statement, forecasts and press conference on Wednesday. While the first quarter has been a little disappointing on the activity front, the labour market continues to power ahead (although wages growth remains sluggish), and both core inflation and survey measures of inflation expectations have remained fairly stable. In financial markets, US equities have more or less gone sideways since January, FI has sold off and the dollar (DXY) has rallied over 5%. Most of the commentary from FOMC members in recent weeks has been consistent with previously expressed views on timing of lift-off, some are arguing for June, others later (see here for my views on the last minutes and here for views on Williams recent speech and neutral real rates). So taking the statement first, below is my attempt to write it for the FOMC for Wednesday. Strikethrough for deletions and italics for new text. Key sentence is in bold. Information received since the Federal Open Market Committee met in DecemberJanuary suggests that economic activity has been expanding at a solidmoderate pace. Labor market conditions have improved further, with strong job gains and a lower unemployment rate. On balance, a range of labor market indicators suggests that underutilization of labor resources continues to diminish. Household spending is rising moderately; recent declines in energy prices have boosted household purchasing power. Business fixed investment is advancing, while the recovery in the housing sector remains slow. Headline inflation has declined further below the Committee’s longer-run objective, largely reflecting declines in energy prices, but core measures have fallen by less. Market-based measures of inflation compensation have declined substantially in recent monthsremained low; survey-based measures of longer-term inflation expectations have remainedbeen stable. Consistent with its statutory mandate, the Committee seeks to foster maximum employment and price stability. The Committee expects that, with appropriate policy accommodation, economic activity will expand at a moderate pace, with labor market indicators continuing to move toward levels the Committee judges consistent with its dual mandate. The Committee continues to see the risks to the outlook for economic activity and the labor market as nearly balanced. Inflation is anticipated to decline further in the near term, but tThe Committee expects inflation to rise gradually toward 2 percent over the medium term as the labor market improves further and the transitory effects of lower energy prices and other factors dissipate. The Committee continues to monitor inflation developments closely. To support continued progress toward maximum employment and price stability, the Committee today reaffirmed its view that the current 0 to 1/4 percent target range for the federal funds rate remains appropriate. In determining how long to maintain this target range, the Committee will assess progress–both realized and expected–toward its objectives of maximum employment and 2 percent inflation. This assessment will take into account a wide range of information, including measures of labor market conditions, indicators of inflation pressures and inflation expectations, and readings on financial and international developments. Based on its current assessment, the Committee judges that it can soon begin to consider patient in beginning to the process of normalizing the stance of monetary policy. However, if incoming information indicates faster progress toward the Committee’s employment and inflation objectives than the Committee now expects, then increases in the target range for the federal funds rate are likely to occur sooner than currently anticipated. Conversely, if progress proves slower than expected, then increases in the target range are likely to occur later than currently anticipated. The next area of focus will be the “dot” chart. According to OIS pricing, the market remains around 50bp below the median Fed voter for end-2015 and over 100bp below by end-2016 (the difference is even larger by end-2017, but the FOMC members would put huge uncertainty bands around their views that far out). 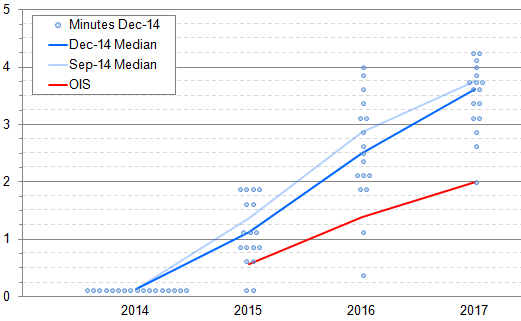 Will the FOMC dots come down to meet the market? I doubt it. I haven’t heard anything from the FOMC, nor seen anything in the data since December to make me think that there will be a major re-assessment this month. Next, will come the focus on the activity, labour market and inflation forecasts. For 2015, I expect GDP to probably be revised down a little due to weaker-than-anticipated Q1, unemployment to also be revised down a little given the continued rapid progress and inflation to also be revised lower on account of energy. But look for any change in the 2016 inflation projection, as it will give the best guide to how the members are weighing up the timing and pace of hikes. Finally, the press conference itself will give Yellen the opportunity to put her own nuance [spin] on things. This is not to be underestimated. Eg in December the statement looked to have a few new dovish elements, only for Yellen to come out and sound really quite hawkish. Overall, I expect her to stress data-dependence, as usual, but to sound cautiously optimistic about starting the process of normalisation in the not too distant future. She will be at pains to make sure that it doesn’t sound like a certainty for June; not least because I still think that the odds are still split between then and September. But she therefore won’t want to rule it out either.